For every developer making millions in Apple’s app store, there are thousands who’ve had their dreams smashed into a million little pixels. What makes the App Store so popular with developers–and how can you succeed? One developer’s tale of hitting the Apple jackpot. They are the Appillionaires: Smart, ambitious dreamers in bedrooms and garages across the world, plotting the future of mobile apps. Their tools are inexpensive–a MacBook Pro and an iPhone–but overnight the Appillionaires can amass a fortune from selling software on the iTunes App Store. They lead a revival of the hobbyist programmer. Not since the days of the Commodore 64 and Atari 2600 has indie software been sold by such tiny teams of programmers to such massive numbers of consumers. The money flows to the Appillionaires even as they sleep. While they dream their Angry Bird-dreams, invisible electronic transfers push money into the Appillionaires’ bank accounts from App Stores in over 80 different countries. As much as $250 million gets spent at the App Store in a single month. Over 10 billion apps have been sold on the store to date and it’s estimated that Apple has signed up at least 79,000 software publishers to the iOS (iPhone and iPad operating system) club. The App Store had established some kind of intravenous connection to my body and was pumping me full of Apple-branded heroin. It’s this label “gold rush” that has been most often applied to the App Store. The potential for success, and risk of failure, is so great that in many ways the App Store has provoked a gold rush among developers. Although the successes are spectacular, the failures are apocalyptic. The mainstream press focuses on the glorious few and gives very little attention to the money being lost on the App Store–a problem compounded by the embarrassed silence of those struggling to turn a profit on their work. In a climate where approximately 540 apps are submitted for review every day, it’s easy to see why the Appillionaires are an exclusive and rare breed. Back in the ’80s, a catastrophic failure to sell software was a more obvious and public humiliation. Take Atari’s “E.T. the Extra-Terrestrial” (1982), a failed video game which left the company with losses of over $100 million and the embarrassing problem of what to do with 3.5 million unsold E.T. cartridges (the answer, apparently, was to bury them in a New Mexico landfill). But today such failures are even harder to see with the naked eye. 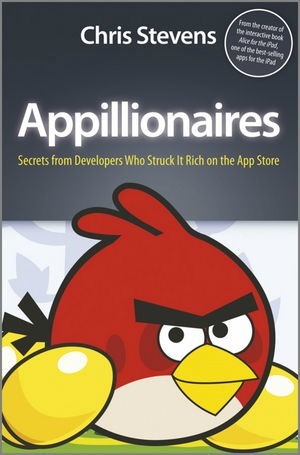 For every Appillionaire, there are several thousand invisible, failed app developers. These developers have had their dreams of app superstardom cruelly smashed into a million little pixels. Given its unpredictability, what makes the App Store so popular? One theory is that we enjoy the strange psychological lure of uncertainty. Researchers have discovered that we often find relationships more compelling if the object of our affection is mysterious and non-committal. The image of a girl sat on a lawn picking petals from a flower and musing, “He loves me, he loves me not” is a fairly accurate depiction of a developer’s relationship with Apple. On one hand the girl with the flower hopes that “he” loves her, but on the other hand a lot of the fun is down to not knowing. It’s human nature that we are attracted to the thrill of never being quite sure where fortune will smile, and there are few businesses where that feeling is more acute than iOS development. Everything about the process is uncertain. Indeed, as much as app development has been called a gold rush, there is an equally loud theory that it operates more like a casino. The counter-argument is that life itself is hard, very much like rolling a dice at times. It might be that the App Store simply gives developers the illusion of an ordered system, with top-ten lists and sales-tracking, but ultimately it is human nature and the unpredictable whim of the masses that determine the success of an app. The App Store might look like an ordered system, but really it’s just a layer over the messy reality of selling anything. I know first-hand the extraordinary rush of creating a global hit on the App Store. I was one half of the two-person team that created Alice for the iPad. The book became so popular that it was a star guest on the Oprah Winfrey show in the week the iPad launched in the U.S.
Around 3 a.m. the day after Alice for the iPad made us a fortune, I finally switched the computer off, stared at myself in the mirror, and wondered what the hell I had become. The App Store had established some kind of intravenous connection to my body and was pumping me full of Apple-branded heroin. More people than I could actually visualize–hundreds of thousands of people–were playing with an app we created and, what’s more, they were paying for it. The thought sent me into the throes of a weird manic episode caused by people I didn’t know tapping the “Install” button next to Alice on their iPad screens. This was my first taste of the Appillionaire buzz, and it’s a feeling that’s since been described to me by many of the people I interviewed for my recent book. The Appillionaire buzz is more powerful than anything on the streets. It’s a hugely enjoyable sense of excitement mixed with satisfaction, but it is a disgusting sight to behold: a man cradled in the arms of his own ego being rocked to sleep. It’s this sensation, or the aspiration to feel this sensation and the financial rewards that come with it, that drives many people to create apps for Apple devices. However, I’m not cynical enough to believe that it’s the only reason. There is pleasure to be had from the simple act of creating a product and selling it. However, an increasing number of entrepreneurs have begun looking to the App Store purely to cash in on the amazing popularity of mobile applications. Although the term “gold rush” was initially used by the press as a simple label for the sheer volume of developers flocking to the iPhone platform, it has recently become an oddly prescient historical reference point for the way the app scene is developing. The store has become a magnet for the over-optimistic with money to spend on getting their app built. I’ve sat in meeting after meeting with recent university graduates who have scraped together thousands from friends and family with the intention of making a fortune on the App Store. Almost without fail their ideas have been vague, or based on gut instinct, rather than the commercial realities of the world’s most competitive software market. The illusion persists that there’s gold in them hills but, for the majority, there is nothing but dust. It’s a reality that seasoned developers are only too familiar with. What then has caused this huge chasm between the average programmers experience on the App Store and the public’s opinion that apps are easy money? Most likely it is the gap between the cost of building an app and the potential reward. Just like a casino, app developers are aware that the majority of apps fail, but there remains a glimmer of hope that they could be the one; that this time the winning hand will be theirs. It’s a sense of hope compounded by the media’s love affair with Apple’s products. Many online forums are filled with developers who cannot understand why the gold-rush narrative peddled by the mass media is not reflected in the reality of selling software on the App Store. The masses were sold the Appillionaire dream, but the reality was a few hundred dollars in a jam jar–and that’s if they’re lucky. It’s sometimes difficult to know whether to react with sympathy to the repeated failures on the App Store–I’ve been there myself with some apps–or to simply shrug and dismiss it as the way of the world. While many developers accept defeat with good grace, with others you feel a sense of entitlement that is suffocating. But, for a sobering comparison, you might take a look at the number of scripts submitted to Hollywood every year compared to the number of screenwriters actually making money. Or look at the number of novels submitted to publishers, compared to the number that turn a profit. The truth of the matter is that success in any creative discipline is exceptionally difficult and the bulk of profit tends to come from a tiny niche of super-successful titles. For every Doodle Jump or Cut The Rope there are several thousand flops. The App Store is littered with dreams of app superstardom that ended in catastrophe, and this is just the beginning. Perhaps it was inevitable, when the company behind the marketing success of the iMac and the iPod turned its hand to promoting independent software development, that the public image of developers would change forever. Apple has literally transformed the social acceptability of programmers and overseen the rise of the geek. It is this, the “cool-ification” of programming, that might be the greatest trick Apple has ever pulled. At dinner parties where the job title of programmer was treated with about as much interest as surveyor, now suddenly we have entered an era of programmer as superstar. Adapted from Appillionaires: Secrets from Developers Who Struck It Rich on the App Store, with permission from John Wiley & Sons, Inc.